The most important day of the year is almost here! 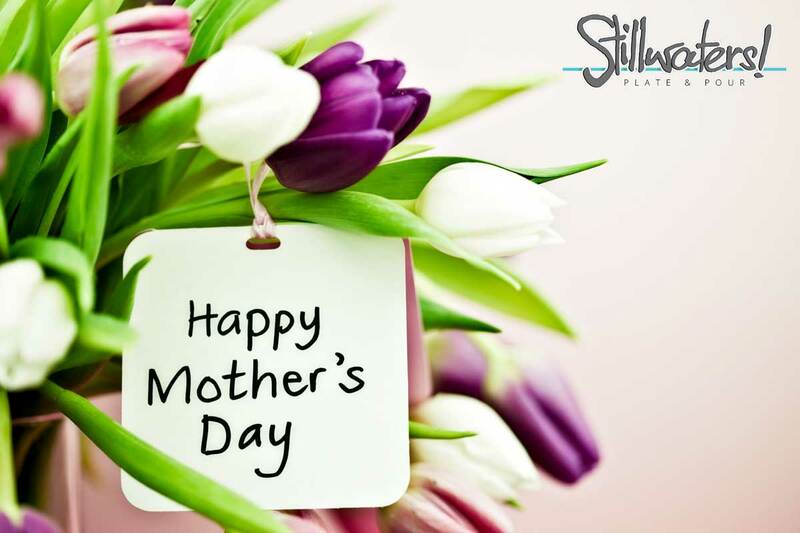 Celebrate mom on Mother’s Day with our Sunday Brunch Buffet on Sunday, May 12 with seatings at seatings at 9AM, 11AM and 1PM. Price is $36.99 for adults, $14.99 for children and children 4 and under is free. 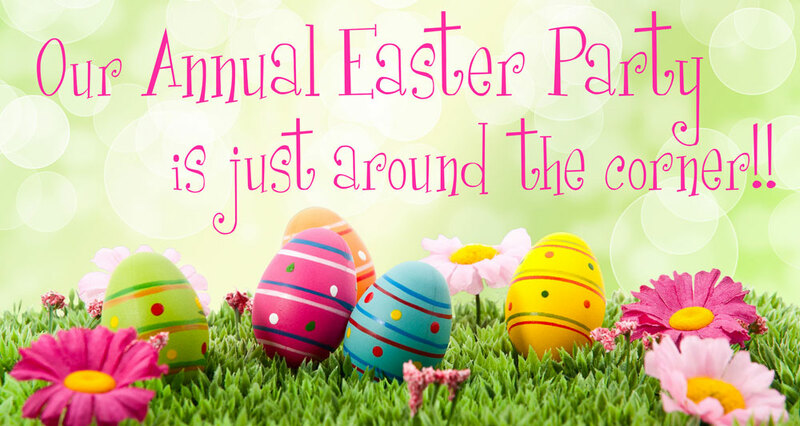 Join us for our Easter Sunday, April 21 Brunch Buffet!!! Seatings at 9AM, 11AM and 1PM. He. Is. Back! 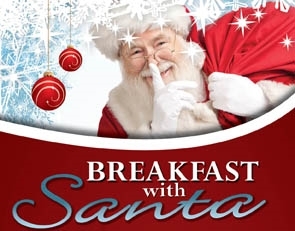 Our annual Breakfast with Santa returns Sunday December 16th! 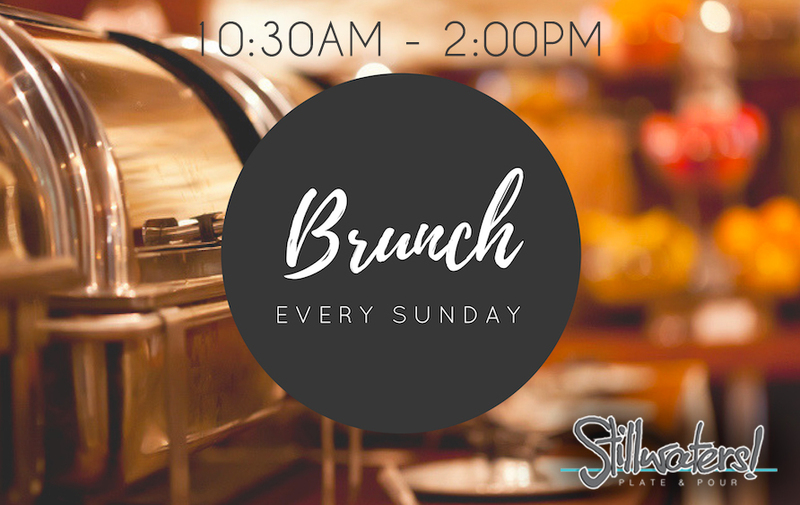 Seatings are at 9am, 11am and 1pm. Prices for the buffet are $21.99 for adults. $13.99 for 5-12 and 4 and under eat free! Our 5th annual Lobsterfest is Wednesday August 15th beginning at 6:30pm! 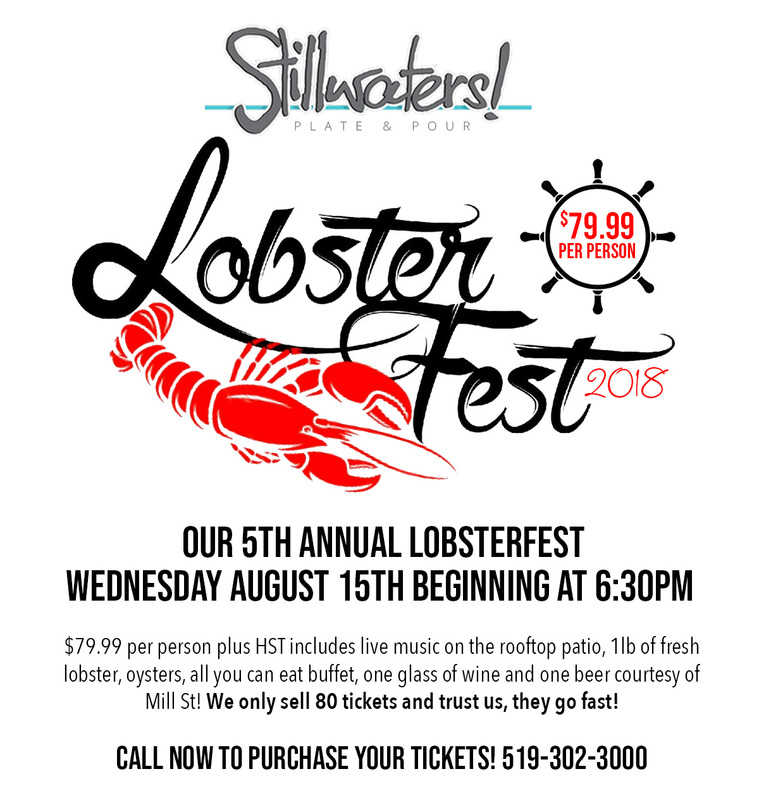 $79.99 per person plus HST includes live music on the rooftop patio, 1lb of fresh lobster, oysters, all you can eat buffet, one glass of wine and one beer courtesy of Mill St! we only sell 80 tickets and trust us, they go fast! ROOFTOP PATIO IS OPENING SUNDAY MAY 20!!! Hello Everyone! 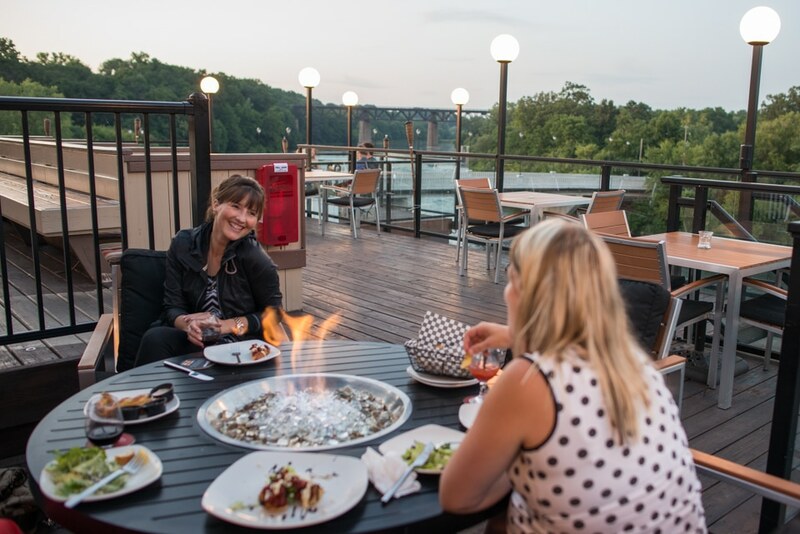 The rooftop patio is opening Sunday May 20th! (Weather permitting). As a friendly reminder when our rooftop patio opens we stop taking reservations for any level of the restaurant except for Sunday brunch. 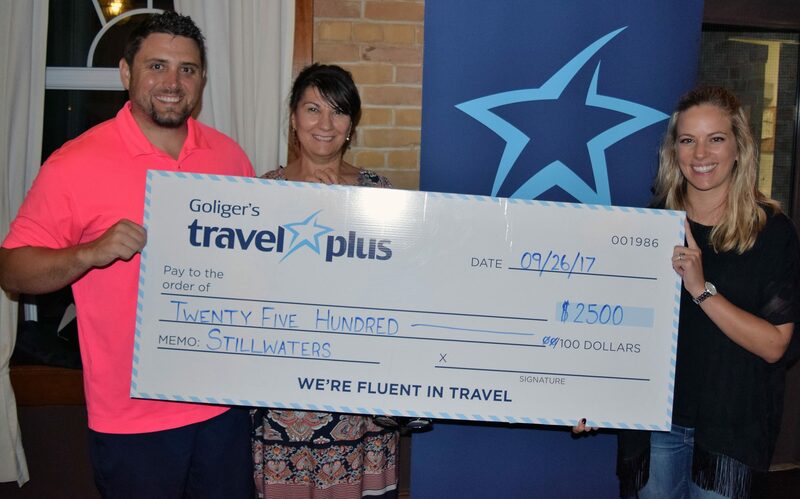 Winner of a $2500 travel voucher courtesy of Goligers Travel Paris! Congrats to Trent Brown!! (represented by his wife Kelsey) winner of the Stillwaters/Cobblestone Public House $2500.00 travel voucher courtesy of Goliger’s Travel Paris! A great time was had by all at our giveaway party last Tuesday in support of The Canadian Deafblind Association! Thank you again to Goliger’s for donating such an incredible prize!! Winner of a $5000 travel voucher courtesy of Goligers Travel Paris! Congrats Paul!! 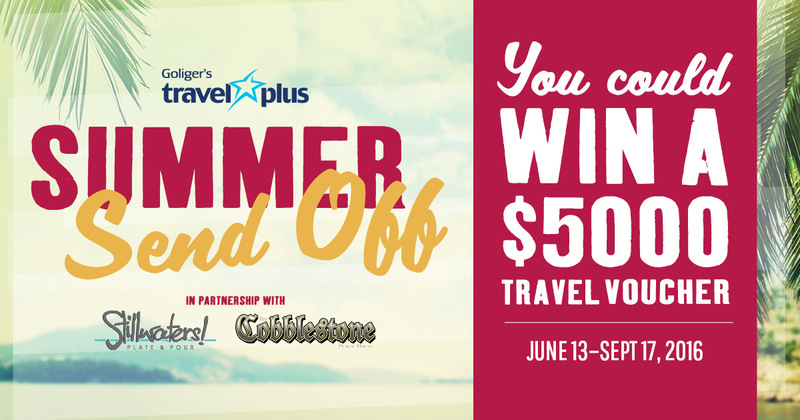 Winner of a $5000.00 travel voucher courtesy of Goligers Travel Paris! What a fun night last night!! Thanks to all qualifiers for coming out for the party! Our extensive menu focuses on market fresh quality ingredients sourced as locally as possible. Our venue is the perfect setting for every group event you can possibly imagine! Contact us to book.